Much of the information for this section came from the article “Alias Kid Cann” by Paul Maccabee that appeared in the November 1991 Mpls/St. Paul Magazine. Maccabee is the author of John Dillinger Slept Here: A Crooks’ Tour of Crime and Corruption in St. Paul, 1920-1936. Also see the 1930s section of Police and Crime. 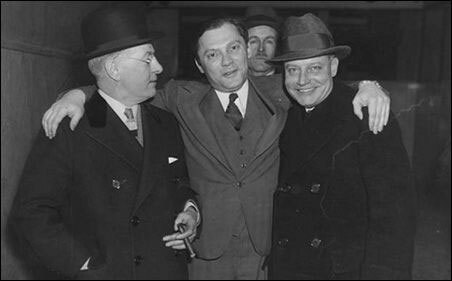 Bootleggers flourished during Prohibition, and our local gangster was Isadore “Kid Cann” Blumenfeld. Blumenfeld was born in Romania on September 8, 1900, and came to Minnesota via Canada in 1902. He married his wife Lillian Lee (born 1904) on August 25, 1936; they had no children. From 1929 to 1933, Cann was involved in a bootlegging operation that originated in New Orleans and Canada, supplying the Minneapolis/St. Paul area. He was indicted in New Orleans but he didn’t show up for trial and the charges were dropped. On August 23, 1933, a federal grand jury in Oklahoma City, Oklahoma returned a bill charging conspiracy to kidnap oilman Charles Urschell against George “Machine Gun” Kelly and others, including none other than Isadore Blumenfeld and his buddy, Edward “Barney” Berman. It was thought that Blumenfeld had been involved in distributing the ransom money, but he was acquitted. He would be indicted several times for bootlegging, but never spent a day in jail. The Kid had a knack for being acquitted. In her book Easy Street, Susan Berman describes the return of her father, gangster David Berman, to Minneapolis in 1934 after a stretch in Sing Sing. He used [his brother’s] base of gambling clubs to start out with and then quickly took over the race wire and the coin machines (slots and pinballs). My father’s Syndicate … contributed a great deal of money to Mayor Marvin Kline’s campaign. When Kline won [July 1941], my father kicked out the rival group led by Kid Cann and took over the gambling for the whole town. Berman’s victory was apparently short-lived. He fought with the Canadian military during World War II, and when he returned the election of Hubert Humphrey as Mayor of Minneapolis meant that gambling was over in the city. Berman moved to Las Vegas in 1945. In 1961 he was finally convicted of “white slavery” and bribing a juror, and sentenced to eight years in Leavenworth.. It came to light that he was the recipient of some Las Vegas casino money. 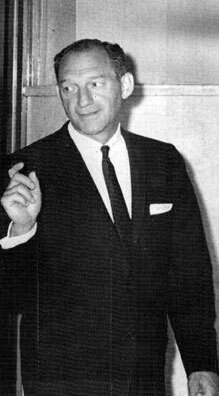 He was paroled in 1964, and immediately went to Florida with other mobsters, including Meyer Lansky, to get rich quick buying real estate in Miami Beach. They also dabbled in illegal stock market deals and money laundering. In a bizarre twist, he took on the persona of “Dr. Ferguson” or “Fergie,” a respectable millionaire philanthropist, and insisted that people address him as such. One explanation of the nickname is that he was always forgetting something: “fergushen,” in Yiddish. A defender says that he paid his taxes and made his money honestly by owning liquor stores and the gift shop at the Sands Hotel in Las Vegas. Robert Whalen says that in the 1950s he lived on Glenhurst – he delivered his paper. David (Doc) Blanchard and I had paper routes in the Sunset Gables area near France Avenue. The very best customer on my paper route was Kid Cann Blumenfeld. When I collected on a weekly basis, should the maid come to the door, I would simply say that I would come back again. The reason was that Kid Cann, in addition to paying for the paper, would give me all the change that he had in his pocket. Then, at Christmas time, he would give me a roll of bills. Both my mother and I were shocked that he would give that many dollars to a paper boy as a Christmas gift? William Taft, Sr. said Cann had a home on Red Cedar Lane, a cul-de-sac at 53rd and Upton Avenue, So. A 2008 article in the Star Tribune says that it’s rumored that Kid Cann lived in a castle-like stone home at 4700 Circle Down in Golden Valley (North Tyrol Hills). It was built in 1942. When he first came to Minneapolis in 1902 he lived at 824 S. Seventh Street in Minneapolis. When he was five or six, he lived on Fourth Street between 14th and 15th Avenue, S. In 1906, according to INS files, the Minneapolis school records indicate that one “Isidore Blumenfeld” had lived at 1014 1/2 Fourth Street So. According to Blumenfeld, as a boy he then moved to 1513 Fifth Street So., then to 17th Avenue So., then to 16th Avenue, So., across the street from the Adams School. From there, he moved to Elliott between 19th and 20th. And then? “I was big enough to be on my own,” said Blumenfeld. Somewhere in there he lived at 429 – 14th Ave. So. He was sentenced to one year in the Workhouse in 1934 for operating a still. He set up his first home for himself as a young man on Colfax, between 35th and 36th Avenue, So., in around 1938. He then moved to 3948 First Avenue, So. He then moved to 3417 West 38th Street, four blocks away from St. Louis Park. The Hennepin History Museum has a set of 8″ x 10′ photos of this house, including several interior shots. One of the pictures indicates that it is the Bates mansion, but a notation on another photo says “Kid Cann.” The house was built in 1930, and is across 38th Street from Minikahda Golf Course. The property has been subdivided since the pictures were taken; the house next door at 3800 Abbott wasn’t built until 1969. In 1951-52, a news article and the Minneapolis phone book put him at 2305 Mount View Avenue. From 1961 to 1964 he resided in Leavenworth Prison. Once out, he moved to Miami Beach. Maccabee has sifted through thousands of documents and found no evidence that Cann ever lived in St. Louis Park. They say Kid Cann retired in St. Louis Park’s Jewish community. He died of heart disease on June 21, 1981 at Mt. Sinai Hospital in Minneapolis. He is buried at the Adath Yeshurun Cemetery at 56th and France Ave. in Edina (Row 1, Section 3). His grave is marked by just a small plaque, with no big headstone or memorial. 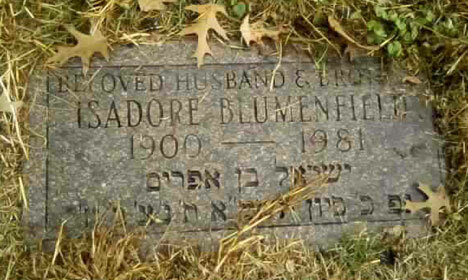 Interestingly, his name is spelled Blumenfield on his grave marker and death certificate. There is a plaque for Lillian next to Isadore’s, but it has only a birth year on it. Click here for pictures from the Minnesota Historical Society. A good article is from the Twin Cities Daily Planet. Some joker out there maintains a Kid Cann Facebook page, posting pithy sayings supposedly attributed to the Kid. 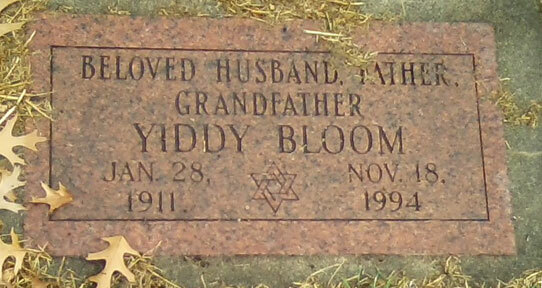 Yiddy Bloom was born Jacob Blumenfeld on January 28, 1911. His wife Verna Kraemer was born on July 29, 1910. Yiddy and Verna were married in Sioux Falls, South Dakota. He legally changed his name to Yiddy Bloom. He and Verna bought/built their home at 2857 Glenhurst in 1939, which is when they are first listed in the St. Louis Park Directory. They previously lived at 2805 Xerxes in Minneapolis. The Glenhurst house is described as a beautiful gray stone house on the corner of Glenhurst and Sunset Blvd., near Highway 7. Yiddy was the manager of the East Side Liquor Store from at least 1939 to 1949. From at least 1956 to 1958 he worked in real estate. In about 1958 Yiddy built the house at 2430 Cedar Shore Drive facing Cedar Lake in the middle of the block between Basswood and 25th. It is just within the Minneapolis border between St. Louis Park and Cedar Lake. Along with brother Isadore, Yiddy was convicted with two others of siphoning profits of nearly a million dollars from liquor stores and bars through a maze of syndicates; the conviction was reversed on appeal. In 1978 he pled guilty to a stock manipulation conspiracy and was sentenced to a year in prison. This may have been the financial scandal referred to as the Magic Marker case. Yiddy died on November 18, 1994 in Hopkins. He is buried in the same section as his brothers. Verna died on September 22, 1991. The Blooms had a daughter LaVonne (“Babe”) Hawley. Son Jerrold (“Jerry”) Bloom was born in Minneapolis on July 24, 1937 and lived most of his adult life in Miami. He played college football at Arizona State University and had a very brief football career with the Dallas Texans. His career was as a homebuilder. He died on October 27, 2011 in Arizona. He was survived by his sister and his wife, Irene “Apple” Bloom. Left: Yiddy Bloom, 1961. 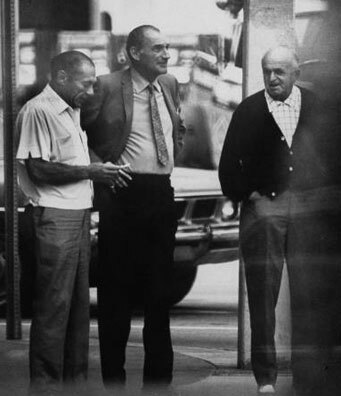 Right: FBI surveillance photo of Yiddy Bloom, 1969 (middle). 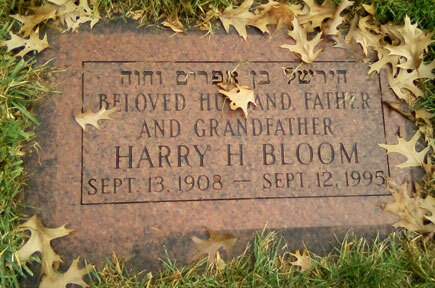 Harry H. Bloom was born on September 13, 1908. H wife Lenore was born on January 8, 1908. Harry and Lenore moved to their house at 2450 France Ave. So. sometime after 1949 (definitely by 1961). Their house on France is described as a huge rambler overlooking Cedar Lake. That number is not an address today, and the closest we can find is 4000 W. 25th Street in St. Louis Park. This house, with its immense grounds, faces France Ave. and was built in 1952. Harry was alternately in real estate and the manager of the Lake Street Liquor Store. It is said that he developed mobile home parks. In 1962 he is listed as retired, and in 1963 he is listed with no occupation. From 1964-66 they lived at 4400 Minnetonka Blvd., Apt. 101; there is no listing in 1967. Harry died on September 12, 1995, and Lenore died on August 28, 1901. Harry and Lenore had two sons; Marvin died in 2009. 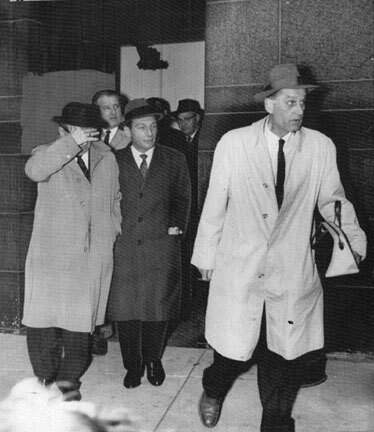 Harry Bloom is pictured above in the middle in dark coat with his hand in his pocket. Shielding his face is partner Abe “Brownie” Brownstein. Photo is from March 1961 trial for liquor license fraud in Minneapolis. The conviction was overturned.